Whenever I step into a new city, I am afraid. I guess we all are. The new people, crowd, the fear of getting robbed or groped, it’s something that is naturally instilled in every North-Indian girl. Same was the case with me when my flight landed at Mumbai Airport. It wasn’t the first time I was visiting this city, I had been here once before, when I was little, but yes, it was the first time that I was visiting Mumbai with all my five senses open and ready to explore! Those were just two days but then, but what I experienced was worth a lifetime. The journey from airport to hotel was mesmerizing. The buildings stood proudly tall, the tar-laden smooth roads, the sumptuously huge fly-overs, the big hoardings glamorously portraying the essence of the city – Bollywood – a lot had changed since the last time I had visited it, but then it was a vague memory, like a memory from a distant dream or maybe a vision from cocaine-eyes! But I was awake today, awake to every single frame my eyes were capturing. My DSLR hung around my neck was sitting idle as my eyes were doing the job more perfectly. The Dadar station which looked like a carpet of people spread across, reminded me of togetherness, of every festival I had celebrated in India, and Mumbai – it was celebrating every day, it was celebrating life! The walking crowd reminds you to be continuous, it invites you to walk along, breath with it, live. After two days of my stay, when it was my time to say goodbye at Marine Drive, the whiff of oceanic-air, refreshed my soul. I stood there, silently, observing the ocean, feeling the wind, trying to get answers, trying to know the meaning of life, why was I here? What was the purpose of my being? I never felt so much thoughtful or philosophical, maybe the Arabian Sea had the answers to all of it? The dusk was approaching and sun was drowning in the ocean. The orange-hue spread all across the purple sky, the birds returning to their homes, Marine Drive was filling up with life. Couples embracing each other, youngsters jogging and running around, old-folks buying ice-cream for the grandchildren. Life had just come full circle for me. Just a look around and the sea had answered all my questions. I glanced into the setting sun once again and closed my eyes. The wind gently caressing my face and the smell of the ocean seeping its way inside my skin. I let myself drown with the sun. When I opened my eyes, it was dark. I stepped down of the promenade and took a cab to the airport. My flight was due in the night. As I was moving away from the city, my heart was aching unpredictably. It was like leaving your first love, for the first time. That sweet and painful heartache rushed like adrenaline in my nerves and I opened the window and set my head on the pane, feeling the city for one last time, letting my hair open and allowing the breeze to caress them. I behaved as a typical broken-hearted lover with a sharp pain in my chest, as if I was going to die the same night that the lovers made love. 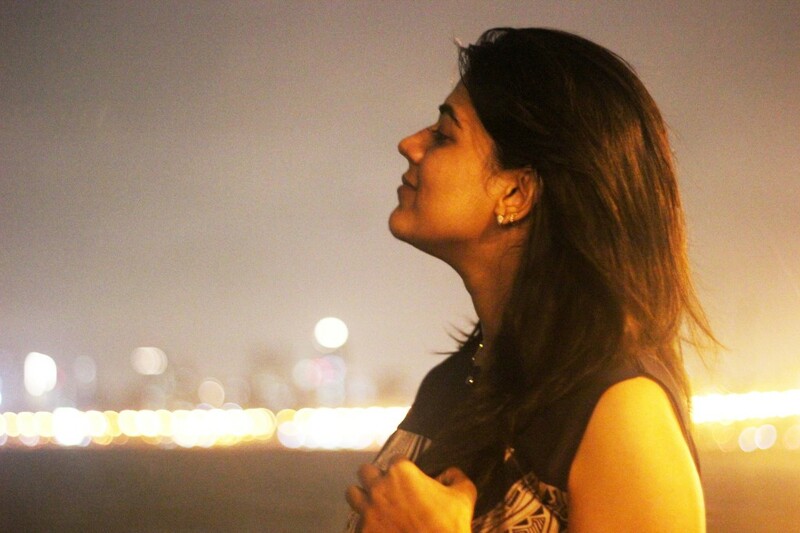 Mumbai had made me poetic in a way I never imagined to turn. Teary eyed, I picked up my bags and headed for Terminal-2. Mam, this description took me to a journey of emotions! Nice one, enjoyed it! Have you experienced cocaine ? Your also welcome. May be some day we’ll host you in Pakistan. Not disagreeing with you, but just offering you a different perspective. Read the complete work ‘The Doors of Perception’. Its an eye-opener.